OS X 10.10 YosemiteはOS X 10.8 Mountain Lionや10.9 Mavericksより早くOS Xのシェア50%に近づいているもよう。 | AAPL Ch. For December, Yosemite accounted for 45% of all instances of OS X tallied by Net Applications, which estimates operating system user share by counting visits to the websites that deploy its metrics package. 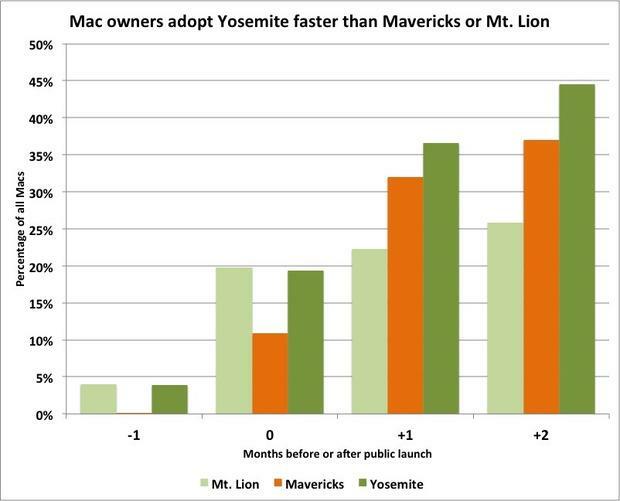 It was the first time that Yosemite became the most popular OS X edition. Yosemite’s brisk uptake tempo also indicated that even though many have questioned Apple’s software quality and called for the Cupertino, Calif. firm to slow down its release pace, large numbers of Mac owners continued to upgrade. Net Applications’ data tells nothing about customer satisfaction with Yosemite, of course; rolling back to an earlier version after upgrading requires a back-up and more time than most people would want to spend. What is clear is that Apple’s bet on free OS X upgrades has been successful at moving more Mac users to the newest edition faster than did even low-priced upgrades. According to Net Applications, one in five Macs ran an unsupported edition of OS X in December, about the same percentage as the month before. Apple has dropped security support for 2011’s Lion and earlier versions, meaning those editions no longer receive vulnerability patches.